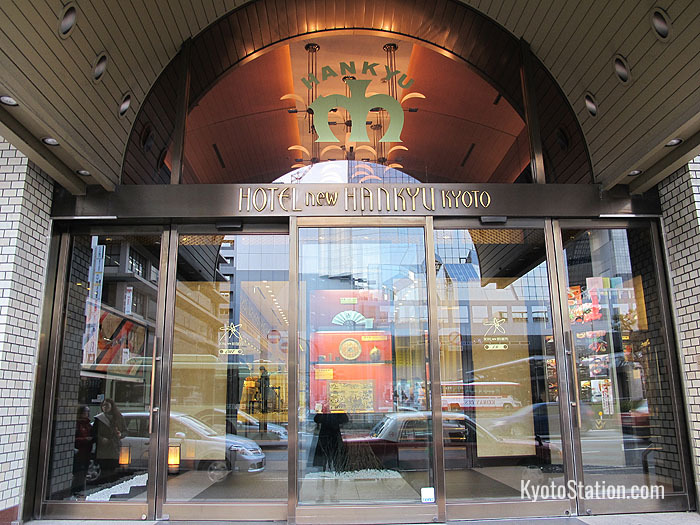 Hotel New Hankyu is a long-established hotel that cuts a grand figure among the many hotels surrounding Kyoto Station. First opened in 1981, the hotel has venerable atmosphere, but is well-maintained, with elegant décor, excellent service, and first-rate facilities. 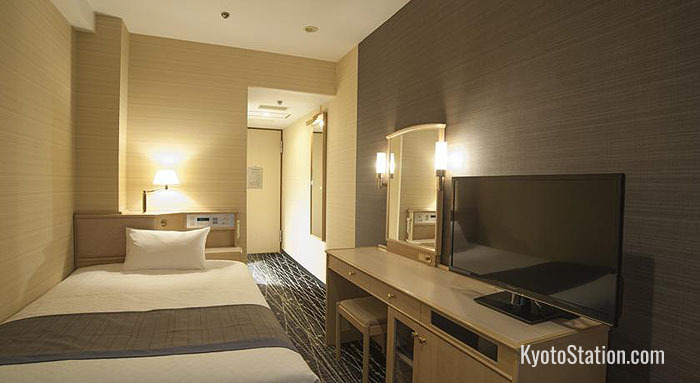 Situated directly across from Kyoto Station’s north central exit, the location of this hotel couldn’t be more convenient. 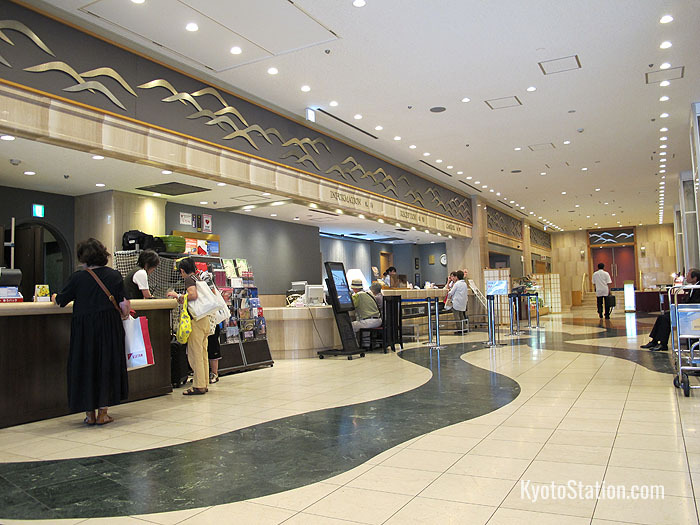 There are many shopping, dining and nightlife venues in the surrounding area, with entrances to the Porta underground shopping mall directly outside the hotel and the Kyoto Yodobashi department store directly behind it. 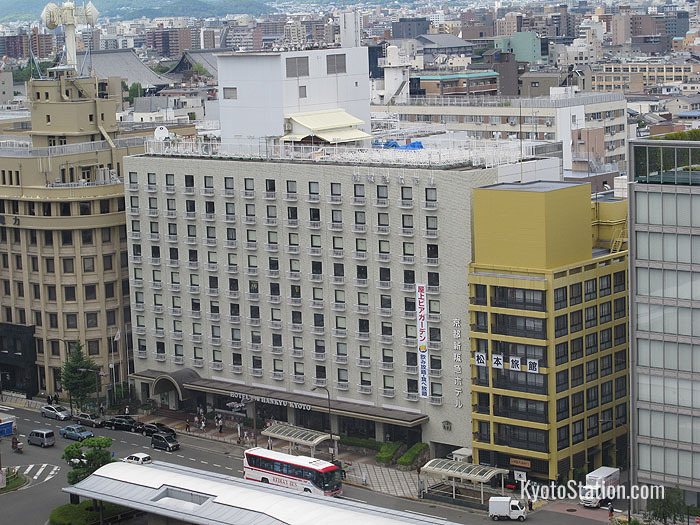 Nearby tourist sites of interest include Kyoto Tower which is just one block away and Higashi Honganji Temple which can be reached in a ten minute stroll. 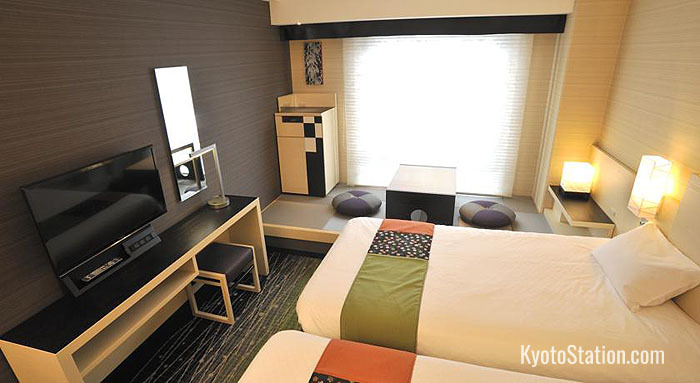 Guest rooms in the Hotel New Hankyu are kept spotlessly clean, with comfortable furnishings and spacious private bathrooms. A variety of rooms are available ranging from very simply furnished single rooms, to the plush furnishings and fine décor of a suite. Twin rooms, double, triple and quadruple rooms are also available. Prices vary according to the season. All rooms come with an air conditioner, air purifier, refrigerator, large screen TV, a tea set and kettle, and night wear. Rooms are also supplied with free Wi-Fi high speed internet access, satellite TV channels, and a morning newspaper. In the bathroom you will find a bath tub and shower, a bidet toilet, a hair dryer, bath towels and hand towels, and a full set of complimentary toiletries. 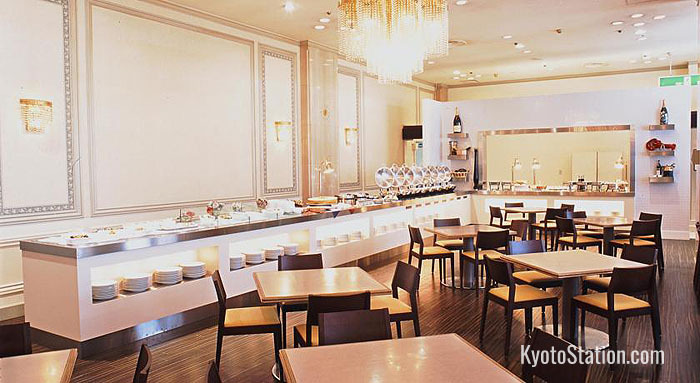 The Lobby Lounge is a relaxing space in which to enjoy coffee or tea with fresh baked cakes and admire the Kyoto style interior. It is open from 10:00 – 19:00. Boulevard is a buffet restaurant serving a la carte drinks and sweets as well as all-you-can-eat style buffet meals with the freshest seasonal ingredients. It is open from 7:00 – 21:30 with last orders at 21:00. Loin specializes in teppanyaki, which is iron plate griddle style cooking, serving up sizzling beef steaks, seafood and local vegetables. It is open for lunch from 11:30 – 14:30, and for dinner from 17:30 – 21:00 with last orders at 20:30. Monselet specializes in luxurious gourmet French cuisine. Lunch is served from 11:30 – 14:30, and dinner from 17:30 – 21:00 with last orders at 20:30. Minokichi serves Kyoto’s traditional kaiseki cuisine, which consists of high grade multi-course meals as beautiful to look at as they as delicious to eat. It is open from 11:30 to 15:00 for lunch, and 15:00 to 21:30 for dinner with last orders at 21:00. Hakurakuten is a chic Chinese restaurant where you can enjoy a range of authentic flavors which include Cantonese, Szechuan, Shanghai and Beijing styles – and all with a little Kyoto finesse! Lunch is served from from 11:30 – 15:00, and dinner is served from 17:30 – 21:00 with last orders at 20:30. Bar Reed a haven of tranquility in the basement, open from 17:30 to 24:00 and serves a wide range of soft drinks and alcoholic beverages. In the summer months guests can also access a beer garden on the roof. There is a breakfast buffet in Boulevard each morning from 7:00 till 10:00 am. The buffet is an eclectic mix of Western and Japanese dishes, rich in variety and includes standards such as croissant, sausage, and eggs. If you fancy a more traditional Japanese breakfast however you can pop down to the basement restaurant, Minokichi, instead and enjoy a set meal of high grade Kyoto cuisine. The surcharge for breakfast in either restaurant is 2160 yen for adults and 1080 yen for children aged 11 and under. There are several items that hotel guests can borrow free of charge. These include: a personal computer, a DVD player, a CD player, a humidifier, a trouser press, an iron, or extra blankets. The following services are also available for a fee: room service, an evening newspaper, dry cleaning, an in-room massage and video on request. The reception desk is open 24 hours a day and the friendly staff can speak English and help you with any enquiries, or book restaurants and taxis for you. You can also request luggage storage and currency exchange at the reception.